If you're looking for something to add a creative edge to your current DJ set-up, try taking the D2 for a spin. Well built. Smart new features. Native Instruments' flagship DJ device, the Traktor Kontrol S8, really impressed us when we reviewed it at the end of last year. With its combination of flexible and intuitive features, broad connectivity and all-round versatility, it was certainly the most powerful and effective DJ controller we've had the opportunity to use to date. Its ability to act as a hub for a more traditional DJ set-up built around vinyl and CD decks made it feel like a real step in the right direction too - pointing towards a positive course for NI's DJ line, in which 'digital' and 'analogue' approaches aren't forced to exist in their own walled-off universes. The problem with the S8, however, is that it requires a pretty significant investment both financially, with a near £1,000 price point, and in terms of space, due to its hefty physical presence. We felt that the S8 was by far at its best with (at least) a pair of turntables or CDJs plugged into it, allowing users to blend classic mixing techniques with Traktor's creative performance features. Once you take this into account, suddenly you're looking at a DJ set-up that's priced out of the reach of casual users, and certainly isn't the sort of thing you can turn up to a club with and expect to find space for in the booth. As such, the arrival of NI's new D2 controller makes a lot of sense. The D2 is effectively a single deck from the S8 - doing away with the mixer and interface elements, and offering a single set of the S8's track control, performance, effect and browsing features. It appears to be aimed squarely at DJs who want to slot the creative elements of the S8's feature set into their existing DJ set-up, allowing them to continue using their existing interface or mixer. Design wise, the D2's top panel is largely indistinguishable from that of the matching section of the S8, other than four small FX Select buttons in the top right corner. Naturally, with the interface and mixer gone, there's no audio ins or outs around the back this time. Instead, connections are limited to power input, a main USB port for connection with a computer, and a pair of USB hub connections, which allow more Traktor controllers or an interface to be daisy chained from the unit. This is a really smart addition, conserving precious USB real estate for anyone who opts to use a pair of D2s, or use one alongside an existing set-up of controllers and DJ interfaces. It also comes with a power splitter adaptor, allowing multiple units to be powered from the same plug. "To think of the D2 as a replacement for a single CDJ or vinyl turntable would be missing the point." Build quality is, as you'd expect, on a par with the high quality of the S8 or Maschine Studio. The metal chassis is sleek and sturdy, and the pads, knobs and faders are solid and responsive. We'd have no concerns about chucking the D2 in a bag and taking it out on the road. It looks great too and the backlit pads and hi-res screen mean it works great in low-light environments. In use, the D2 functions pretty much identically to its bigger sibling, offering excellent control over Traktor's Remix Decks, Cue and Loop functions, Freeze mode, FX and track browsing. It is worth reiterating, however, just how well Native Instruments have implemented the Touch-and-See functionality, which allows the central screen to respond to whichever control is currently being used and seamlessly display appropriate information. As on the S8, it's a great system, and makes the D2's control surface intuitive to work with and shifts focus away from the laptop. The main 'new' feature here, however, is the integration of NI's Stems format. In reality, Stems aren't a huge leap forward from Traktor's existing Remix Set format, and they're not exclusive to the D2 either - both the S8 and F1 are also able to take advantage of the format. The Stem concept is still an interesting development though, because they should hopefully show off both the D2 and the S8 at their best. With its lack of jog wheel, once again replaced here by a touchstrip used for nudging, scratching and scrolling through tracks, the D2 is in danger of suffering from the same image problem that has followed the S8 - that it's a completely sync-reliant, 'on the rails' mixing device with nothing to offer traditional DJs. In reality, to think of the D2 as a straight replacement for a single CDJ or vinyl turntable would be missing the point. For one thing, it's not great at traditional mixing duties, and at times requires multiple fiddly tweaks to replicate the basic functions of a CDJ. More importantly though, simply using the D2 to launch and blend full tracks would be completely overlooking the creative scope of its features. The focus on NI's multi-part Stem mixing functionality, along with the intuitive looping and effects, makes the D2 a great device for bridging the gap between traditional DJ techniques and 'live' performance. Because Stems are an open format, and with the help of the forthcoming Stem Creation Tool, the platform is likely to really appeal to DJ/ producers as a simple but hugely effective way to integrate their own productions into their sets. Sure, the D2 will appeal more to Dance music DJs - particularly House and Techno - than those mixing, say, Funk or Soul, but don't write it off as designed simply for firing off sync'd EDM bangers, as it will equally feel right at home nuzzled up to a pair of 1210s and a stack of vinyl. Our one minor gripe with the D2, is its price. At £429, it comes in at just a little under half the price of the S8 (at £999), which seems a tad steep, bearing in mind it's only a third of the size and lacks the interface and audio elements. 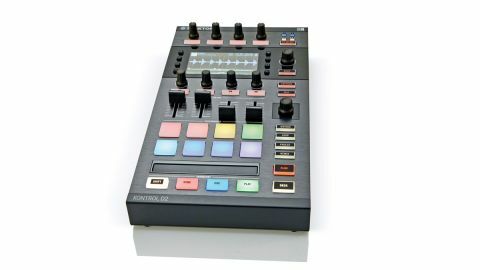 It does come with a full version of Traktor Pro 2, however, and it wouldn't stop us from wholeheartedly recommending it.